This is the view South out of my apartment. 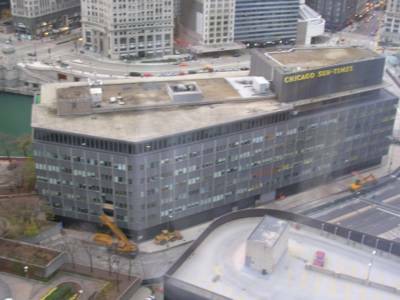 The building used to belong to the Chicago Sun Times newspaper until sold to a certain Mr Donald Trump in 2001. 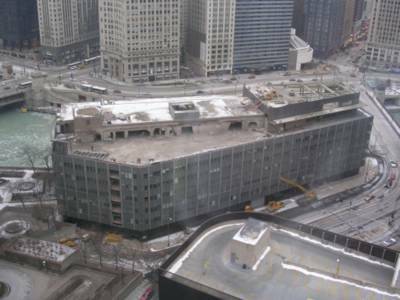 It has been vacant in recent months after the newspaper staff moved to another office, however since Christmas activity has started on the demolition of what is arguably the ugliest building in a city known for it's soaring and elegant architecture. The Donald's plan is to turn the site into the 1,125 feet, 92 story Trump Chicago International Hotel & Tower (see artists impression). The building, that will have a unique asymmetric shape giving it a different appearance from each angle, will contain 300 luxury condominiums, a five-star hotel, a 60,000 square foot health club & spa plus retail and office space. The condos will be priced between $0.5m to $8m and supposedly 40% are already pre-sold! Prior to 9/11 the building was supposed to be bigger with plans for approximately 150 stories. It will now be the 4th highest building in Chicago behind The Sears Tower, The Aon Center (where I work) and The John Hancock Center. Chicago will become the only City in the world with 5 buildings excess of 1,000 feet, firmly putting the home of the skyscraper back on the map. I almost certainly won't be here to see it's progress (it's not due to be finished until 2007) but in the meantime I will snap a few photos as my view gradually changes. I'm not sure if they are going to knock the building down piece by piece or implode it. I'm hoping it's the latter because I'd like to see that. For the moment though the site is becoming an eye-sore, there was flooding in the building this week and last week it caught fire. The building came to National prominence when Chicagoan Bill Rancic was chosen as the first 'Apprentice' last year and was put in charge of development project.